Received: November 11, 2016; Revised: January 18, 2017; Accepted: March 20, 2017; Published online: June 30, 2017. Plasmapheresis has become an essential element of kidney transplantation (KT). In the present study, we report clinical outcomes of filtration plasmapheresis using continuous renal replacement therapy machines with a single filter for the first time in Korea. We retrospectively analyzed six patients who underwent filtration plasmapheresis for KT in our center; plasmapheresis was performed using the Plasmaflex (Baxter®) with a TPE 2000 filter set (Baxter®) in our hemodialysis unit. Five percent albumin was used as the replacement fluid, and intravenous immunoglobulin G was administered after each plasmapheresis session. The target preoperative ABO isoagglutinin titer was less than 1:8. Filtration plasmapheresis was performed in four patients for ABO-incompatible KT, one for antibody-mediated rejection after KT, and the last one for positive T cell crossmatch. Altogether, 46 sessions of plasmapheresis were performed. ABO isoagglutinin titers successfully declined to or below the target level in all patients, and all patients successfully received KT with no significant antibody titer rebound. Acute antibody-mediated rejection and positive T cell crossmatch were well treated with filtration plasmapheresis, and no patient required fresh frozen plasma infusion for coagulopathy. There were one episode of hypotension and three of hypocalcemia. No patients experienced bleeding, infection, or allergic reaction. Filtration plasmapheresis was effective and safe. Although our result is from a single center, our protocol appears to be promising. Historically, plasmapheresis was first applied to humans in 1952 to treat hyperviscosity in multiple myeloma . The first plasmapheresis in kidney diseases was attempted by Bukowski et al ; they successfully treated two patients with thrombotic thrombocytopenic purpura (TTP) and renal impairment in 1977. Since then, plasmapheresis has been widely used in kidney diseases, and transplants were the second most common indication after hemolytic uremic syndrome/TTP, accounting for 12% of plasmapheresis performed for kidney diseases according to Canadian Apheresis Group 2015 registry data . Today, plasmapheresis is considered an essential part of ABO-incompatible kidney transplantation (ABOi KT), treatment of acute antibody-mediated rejection (AMR), and the desensitization protocol for positive crossmatch transplantation. There are currently two types of plasmapheresis, centrifuge and filtration. In Korea, plasmapheresis has been performed in kidney transplant patients by non-nephrologists, most of the time using centrifuge plasmapheresis and fresh frozen plasma (FFP) as the replacement fluids. For the last two years, we, nephrologists and hemodialysis nurses, have performed plasmapheresis using continuous renal replacement therapy (CRRT) machines with a single filter and albumin as the replacement fluid. In this study, we analyzed the clinical courses of six transplant recipients who received filtration plasmapheresis in our center. Six patients underwent plasmapheresis for kidney transplantation beginning in October 2014 at Ajou University Hospital. The reasons for plasmapheresis were as follows: four patients as preoperative treatment for ABOi KT, one patient for AMR after kidney transplantation, and the last patient as preoperative treatment for positive T cell crossmatch kidney transplantation. For the ABOi KT desensitization, a low dose of rituximab of 100 mg per calculated body surface area was administered intravenously four weeks prior to the scheduled date of the transplant. Two weeks after rituximab administration, B lymphocyte count fell down to zero in all four patients in lymphocyte subset analysis. For all six patients, we used dual-lumen venous catheters designed for dialysis for vascular access. Prior to the plasmapheresis, medical staffs confirmed the patients’ laboratory results including complete blood count, prothrombin time (PT), activated partial prothromboplastin time (aPTT), electrolytes, and ionized calcium. We used the Plasmaflex (Baxter®, Deerfield, MA, USA) with a TPE 2000 filter set (Baxter®) for all six patients. Before beginning plasmapheresis, we calculated the amount of replacement fluid according to the following formula: plasma volume (in liters) = 0.07 × weight (kg) × (1 – hematocrit). Five percent albumin was used for the replacement fluid, and its volume was set equal to the removed plasma volume. The blood flow rate (mL/min) was set as 1.5–2.0 times the patients’ body weight in kilograms, and the replacement fluid rate was calculated automatically by the machine according to the filtration fraction order between 25% and 30%. Continuous intravenous heparin was used for anticoagulation except for in one patient with thrombocytopenia. Intravenous heparin infusion was started at 2,000 units/hour, and the rate was adjusted as filter clotting was monitored. With the patient with thrombocytopenia, we used nafamostat mesilate instead of heparin. To detect hemodynamic instability, we checked the patient’s vital signs every 10 minutes during the first 30 minutes, then every 15 minutes during the next 45 minutes, and every half hour thereafter. In each session, normal saline was prepared and connected to the vascular access point in case of sudden hypotension due to volume depletion, and intravenous dexamethasone and chlorpheniramine were also prepared for allergic reactions. We injected 100 mg/kg of intravenous immunoglobulin (Ig) G after each plasmapheresis session; for ABOi KT, the target preoperative isoagglutinin titer was less than 1:8. Plasmapheresis was initially scheduled to be thrice weekly on non-hemodialysis days, but the procedure took place more than three times in a week if there were specific reasons for it (e.g., higher isoagglutinin titers than expected prior to kidney transplantation). Tacrolimus-based triple immunosuppressive agents were administered beginning ten days before each transplant; the doses of each agent were as follows: 0.05 mg/kg of tacrolimus twice daily, 500 mg of mycophenolate mofetil twice daily, and 0.3 mg/kg of prednisolone once daily. This study has been reviewed and approved by institutional review board of Ajou University Hospital (AJIRB-MED-MDB-16-388). The clinical characteristics of the patients are shown in Table 1. The patients’ average age was 48.7 ± 5.1 years, and there were two males and four females. Altogether, 46 sessions of plasmapheresis were performed, and the average procedure time was 130.0 ± 10.3 minutes. Mean blood flow rate was 140.3 ± 10.5 mL/hour, and mean replacement flow rate was 1,500.5 ± 1.1 mL/hour. Mean replacement fluid volume was 3,206.3 ± 490.1 mL. Four patients, A, B, C, and D, underwent plasmapheresis before ABOi KT. The average number of sessions was 6.5, and the target antibody titer was less than 1:16. Since blood type of patient A was O, we measured both anti-A (IgM and total) and anti-B (IgM and total). Likewise, we measured anti-B (IgM and total) from patient B and D because their blood type was A, and anti-A (IgM and total) from patient C because her blood type was B. ABO isoagglutinin titers gradually declined with each session, and each patient’s changes in the titer are shown in Fig. 1. All four patients successfully received kidney transplantation, and only one (patient A) needed one additional session of plasmapheresis right after the transplant due to high total anti-A titer (1:16). The last ABO isoagglutinin titers checked during out-patient visits were as follows: 1:4 for anti-A IgM and total and 1:8 for anti-B IgM and total in patient A (18 months), 1:2 in patient B (13 months), 1:4 in patient C (8 months), 1:2 in patient D (6 months). The patients are visiting the hospital regularly as scheduled with no significant antibody titer rebound, and the longest follow-up period was 24 months. Patient E, a 43 year-old female, received a kidney transplant from a three-loci-mismatched, living unrelated donor. Her creatinine level remained high, between 4 and 6 mg/dL, and it increased further to 9.0 mg/dL on postoperative day 6 (Fig. 2); in addition, her urine output continuously decreased to oliguric range. We biopsied her transplanted kidney on postoperative day 6 and the result was AMR. She went through eight sessions of plasmapheresis along with steroid pulse therapy, and in response to treatment, her creatinine level and urine output improved; at two months postoperative, her serum creatinine remained below 1.5 mg/dL. Patient F, a 51 year-old female, received a kidney transplant from a haplotype-mismatched living related donor, her son. The panel reactive antibody conducted two months before her operation revealed that she had donor-specific antibodies: B27 in class I and DR4 in class II. Mean fluorescence intensity (MFI) was 1,172 for class I and 14,704 for class II, and the T cell crossmatch test by flow cytometry (FCM) conducted one month prior to transplantation was positive. The patient began desensitization 18 days before the transplant. After five plasmapheresis sessions, her MFI values decreased to 359 and 68.5 for class I and class II, respectively, and after seven sessions, she also became crossmatch-negative by both anti-human immunoglobulin-complement dependent cytotoxicity and FCM. A total of eleven sessions of plasmapheresis took place before her kidney transplant. During 21 months of the post-transplant period, she did not experience acute rejection, and her serum creatinine level was 0.7 mg/dL at her 21-month follow-up visit. The overall plasmapheresis safety profiles were excellent. The laboratory results for just prior to the start of the plasmapheresis are shown in Table 2. The complications are categorized as follows. Hypotension is defined as systolic blood pressure below 90 mmHg or a drop of more than 20 mmHg from the baseline with symptoms. Among the six patients, one experienced hypotension (systolic blood pressure of 90 mmHg) and nausea two hours into her first plasmapheresis session, although she immediately recovered after 300 mL of normal saline was loaded. Two patients received 4 g of replacement calcium gluconate once or twice each. Patient B’s calcium level decreased from 8.9 to 6.7 mg/dL and his ionized calcium level decreased from 4.8 to 3.8 mg/dL once, so 4 g of calcium gluconate was infused before his next session. In patient C, after her first session, her calcium decreased from 9.3 to 6.4 mg/dL and ionized calcium decreased from 3.8 to 3.5 mg/dL, so 2 g of calcium gluconate was infused. After four plasmapheresis sessions, patient C’s calcium level decreased from 8.3 to 6.8 mg/dL, and ionized calcium from 4.2 mg/dL to 3.7 mg/dL, and 2 g of calcium gluconate was again replaced before her next session. Calcium and ionized calcium were maintained well in the other patients. Changes in the levels of both according to plasmapheresis are shown in Fig. 3, and neither patient had symptoms related to hypocalcemia. Intra- and post-operatively, none of the patients experienced adverse events related to bleeding, and none required FFP for any reason. Neither PT nor aPTT prolongation related to plasmapheresis was detected (Fig. 4). Patient C showed a significantly decreased platelet count after plasmapheresis, and the reason was thought to be heparin-induced thrombocytopenia. She recovered from it after the transplant, and no patient required transfusion of platelet concentrate. No patients developed fever or any signs of infection during plasmapheresis. Patient D complained of an itching sensation without urticaria or rash on his second session approximately 45 minutes into it. The itching was not considered to be related to an allergic reaction, and it was subsided after antihistamine injection. 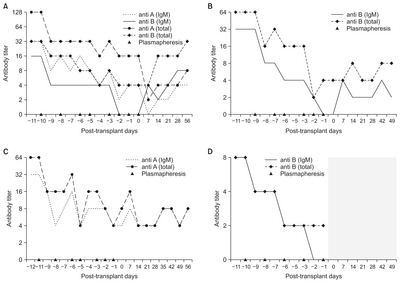 Plasmapheresis is now considered an essential part of ABOi KT, treatment of AMR, and the desensitization protocol for human leukocyte antigen-sensitized patients. ABOi KT is becoming popular owing to the shortage of organs; it accounted for 22.0% of total living donor kidney transplants in Korea in 2015 . We began using filtration plasmapheresis using a single filter with CRRT machines in October 2014 for kidney transplantation, to our knowledge for the first time in Korea. To date, no published data are available in Korea with regard to filtration plasmapheresis, and thus we present our clinical experience with the procedure in this report. Single filtration plasmapheresis is different from double filtration plasmapheresis in that double filtration plasmapheresis needs two filters in a row. In double filtration plasmapheresis, plasma is first separated by a plasma separator, and then it passes through a plasma fractionator, the second filter [5–7]. However, we used a single filter which can be applied to the existing CRRT machines. There are a number of notable differences between our filtration plasmapheresis and the conventional type. One, our procedure uses CRRT machines and a specially designed single filter. The detailed specifications of the plasmapheresis filters are as follows: their effective surface area is 0.35 m2, the internal diameter of the fiber is 330 μm, the wall thickness of the fiber is 150 μm, and the sieving coefficients of the filters for albumin, IgG, and IgM are 0.97, 0.95, and 0.92, respectively . Another difference is that our filtration plasmapheresis is done by hemodialysis staffs in hemodialysis units; this can be advantageous to nephrologists in scheduling patients and monitoring them during the procedure; separately, hemodialysis patients feel more comfortable receiving plasmapheresis in a familiar unit than in one that is new to them. In addition, filtration plasmapheresis is different from conventional plasmapheresis in that the replacement fluid is albumin rather than FFP. This can be advantageous given the relatively high rate of complications associated with FFP . It has been reported that allergic reactions and anaphylatoid reactions are much less common when using albumin instead of FFP [9,10], and in fact, we experienced no allergic reactions related to the use of albumin. In addition, albumin is easy to store and prepare in that it can be stored at room temperature and does not have to be thawed unlike FFP. Usually, after a single session of plasmapheresis, clotting factors and prothrombin levels falls by 50–75% [11,12]; the fibrinogen level also usually decreases to 35–80% after a single session and takes two to five days to recover completely [7,11]. Theoretically, there is an increased risk of bleeding with daily plasmapheresis using albumin substitution , yet there were no bleeding or coagulopathy complications in our study. This was thought to be associated with our schedule because most of the time, we performed plasmapheresis every other day to allow time to replenish the coagulation factors. Another difference is that we used heparin or nafamostat mesilate for anticoagulation rather than citrate. Citrate dextrose is commonly used as an anticoagulation solution in conventional plasmapheresis, and FFP itself contains up to 14% citrate by volume [11,13]. Hypocalcemia is often attributed to citrate toxicity because citrate chelates calcium [11,14]. Accordingly, hypocalcemia is much more common when citrate is used as the anticoagulant and FFP is the replacement fluid ; therefore, routine prophylactic replacement of calcium gluconate is required in conventional plasmapheresis, which was not necessary in our procedures. Filtration plasmapheresis has comparable efficacy in removing undesirable antibodies with that of centrifuge plasmapheresis, as seen in a study by Hafer et al . We did not compare both methods of plasmapheresis in this study, and therefore we cannot assess the relative efficacy of the two methods. However, filtration plasmapheresis was sufficiently effective to achieve our treatment goals in all the patients, and thus, we believe that it is not inferior to conventional plasmapheresis in efficacy. With regard to complications, a number of complications such as hypotension, coagulopathy and bleeding, hypocalcemia, infection, and allergic reaction to the replacement fluid have been reported during plasmapheresis [16,17]. In our 46 total sessions, we only observed one minor episode of hypotension and three episodes of hypocalcemia but no serious complications, and without the use of FFP, we did not experience intraoperative or postoperative bleeding events or coagulopathy. In addition, hypocalcemia was uncommon even though we did not use calcium gluconate routinely. Although our study achieved favorable results, it also had a few limitations. First, the study was limited by its retrospective nature. Second, the number of cases was relatively small and only from a single center. In conclusion, filtration plasmapheresis using CRRT machines and filters has multiple advantages with low complication rates. Fig. 1. (A) Patient A. The patient’s blood type was O and the donor’s blood type was A. (B) Patient B. The patient’s blood type was A and the donor’s blood type was B. (C) Patient C. The patient’s blood type was B and the donor’s blood type was AB. (D) Patient D. The patient’s blood type was A and the donor’s blood type was AB. The ABO isoagglutinin antibody was not detected (shaded area). IgM, imunogrobulin M.
Fig. 2. Changes in serum creatinine levels in the patient with acute antibody mediated rejection. Fig. 3. (A) Changes in serum total calcium. (B) Changes in serum ionized calcium. N = 6. Numbers in the middle imply mean values of each day, and vertical lines imply ranges between ± two standard deviations. Fig. 4. (A) Changes in prothrombin time. (B) Changes in activated partial prothrombin time. N = 6. Numbers in the middle imply mean values of each day, and vertical lines imply ranges between ± two standard deviations. ABOi KT, ABO-incompatible kidney transplantation; AMR, acute antibody-mediated rejection; BFR, blood flow rate; CMV, cytomegalovirus; NA, not applicable; PP, plasmapheresis; RFR, replacement flow rate; RFV, replacement flow volume. PT, prothrombin time; aPTT, activated partial prothromboplastin time. Clark, WF, Huang, SS, Walsh, MW, Farah, M, Hildebrand, AM, and Sontrop, JM (2016). Plasmapheresis for the treatment of kidney diseases. Kidney Int. 90, 974-984. Bukowski, RM, King, JW, and Hewlett, JS (1977). Plasmapheresis in the treatment of thrombotic thrombocytopenic purpura. Blood. 50, 413-417. Canadian Apheresis Group 2016. ., 36th Annual General Meeting 2015, Plasma Exchange Data Review, 2016, Gatineau, Quebec, pp.6-16. Higgins, R, Lowe, D, Hathaway, M, Lam, FT, Kashi, H, Tan, LC, Imray, C, Fletcher, S, Chen, K, Krishnan, N, Hamer, R, Zehnder, D, and Briggs, D (2010). Double filtration plasmapheresis in antibody-incompatible kidney transplantation. Ther Apher Dial. 14, 392-399. Tanabe, K (2007). Double-filtration plasmapheresis. Transplantation. 84, S30-S32. Nakanishi, T, Suzuki, N, Kuragano, T, Nagasawa, Y, and Hasuike, Y (2014). Current topics in therapeutic plasmapheresis. Clin Exp Nephrol. 18, 41-49. Song, EY, Yoon, JH, Lee, JW, Park, CW, Kwon, SW, Kim, DW, Lim, YA, Kim, HO, and Han, KS (2008). Establishment of a national online registry for apheresis in Korea. Transfus Apher Sci. 38, 93-100. Basic-Jukic, N, Kes, P, Glavas-Boras, S, Brunetta, B, Bubic-Filipi, L, and Puretic, Z (2005). Complications of therapeutic plasma exchange: experience with 4857 treatments. Ther Apher Dial. 9, 391-395. Lee, SY, Kim, NH, Jeong, S, Jang, DS, Lee, YM, Na, KR, Lee, KW, and Shin, YT (2007). Clinical outcomes of renal patients treated with therapeutic plasma exchange. Korean J Med. 73, 176-182. Kaplan, A (2012). Complications of apheresis. Semin Dial. 25, 152-158. Min, YS, Kwon, SW, Choe, WH, Kim, BJ, Cho, KJ, and Kim, SS (2011). Analysis of the adverse effects associated with therapeutic plasmapheresis. Korean J Blood Transfus. 22, 161-170. Hafer, C, Golla, P, Gericke, M, Eden, G, Beutel, G, Schmidt, JJ, Schmidt, BM, De Reys, S, and Kielstein, JT (2016). Membrane versus centrifuge-based therapeutic plasma exchange: a randomized prospective crossover study. Int Urol Nephrol. 48, 133-138. Singh, N, Pirsch, J, and Samaniego, M (2009). Antibody-mediated rejection: treatment alternatives and outcomes. Transplant Rev (Orlando). 23, 34-46. Abu Jawdeh, BG, Cuffy, MC, Alloway, RR, Shields, AR, and Woodle, ES (2014). Desensitization in kidney transplantation: review and future perspectives. Clin Transplant. 28, 494-507.